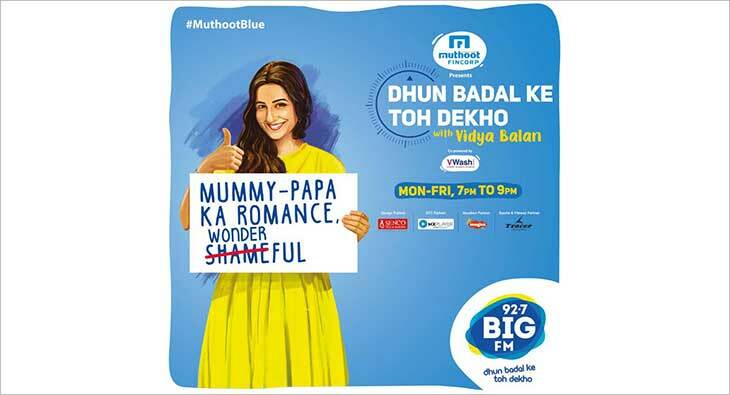 The much-talked-about programme, Muthoot Blue presents ‘Dhun Badal Ke Toh Dekho with Vidya Balan’ will air every weekday evening from 7 PM to 9 PM, with repeats on Saturday and Sunday from 5 PM to 9 PM across HSMs. A special highlights segment named Muthoot Blue presents Dhun Badal ke toh Dekho with Vidya Balan - SPOTLIGHT will be aired across Monday to Friday between 01:00 PM to 02:00 PM. The show will focus on bringing relevant social topics to the fore and spark positive conversations and change redundant perceptions in society. Amplifying innovation and creativeness in programming, the episodes will take up topics ranging from mental health, domestic violence, new age parenting, adoption, body shaming, child abuse, bullying and more. In conclusion, the show will recognize exemplary stories of real-life people who have changed the way the society thinks and behaves, to inspire the listeners. The show will also introduce Reporter Kaviraj as an interstitial, curated basis various topics discussed on the show. The interstitial intends to provide a lighter take on subjects and encourages drawing room conversations on tabooed topics. The episodes will also witness a special celebrity chat segment where they will indulge in an up-close conversation with RJ Vidya Balan around the topic. Every Friday, Vidya Balan would be discussing interesting elements from her films connecting it back to real life instances.